Most of us feel young, active, and not hampered by the chronological number that defines our age. It can be difficult however to feel our age when we have droopy eyelids or bags under our eyes. Although many skin care products claim they can undo visible cosmetic flaws, most wrinkling is impossible to correct without professional intervention. When the skin layers on your eye region start to lose firmness and elasticity, it ultimately results in loose skin layers. Dropping layers of your skin becomes obvious and that is when you see ugly skin folds gradually appearing on your eye region. The technical term for sagging eyelids is blepharochalasia which refers to excess eyelid skin and weak eyelid muscles. The protruding fat patches beneath your dermal layers also characterize blepharochalasia. Since weakened muscles cause droopy eyelids, as soon as this region starts to sag, fat deposits can move in and trigger more harm that may ultimately impede your vision as additional skin hangs down. Eyelid surgery is a superb method to enhance the look of your upper and lower eyelids. Blepharoplasty is also efficient at eliminating the bags under your eyes, which can make you appear tired and look older than you truly are. If you have any one or a combination of the following conditions, you would be considered a good candidate for eyelid surgery. Aesthetic eyelid surgery can usually correct these problems although other treatments may also be needed for optimal results. For example, if your upper eyelid condition is accompanied by sagging of the eyebrows, then a forehead lift may be recommended as well. Smoothing of your crow’s feet may be accomplished with Botox®, chemical peeling, or laser resurfacing procedures and circles beneath your eyes may be treated with fillers such as Hyaluronic Acid or fat as well as bleaching solution or chemical peel. Dr. Moelleken will provide further information if you have an interest in additional procedures during your initial consultation. 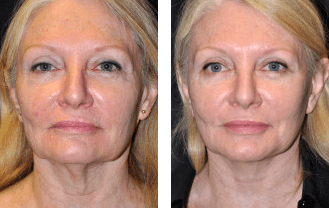 While ever evolving, today’s best cosmetic blepharoplasty procedures are focused around a newfound respect for the problems associated with disturbing orbital fat and the eyelid’s complex system of support. Baggy upper and puffy lower lids can now be addressed surgically with less tissue disruption, scarring, and loss of function, while eyelid orbital fat grafting can soften hollowness. According to the American Society of Plastic Surgeons, blepharoplasty has become the most sought-after facial plastic surgery procedure, surpassing facelift, rhinoplasty, facial implants, and forehead lift. The reason for this is that the contours of the eyelid skin and fat pockets account for a large part of the expressiveness of the face. If your lids sag or bulge, your face may project an inappropriate look of fatigue and lack of vigor despite adequate rest and good health. Eyelid surgery can correct drooping upper lids and puffy bags below your eyes. This procedure does not correct crow’s feet or other wrinkles, eliminate dark circles under your eyes, or lift sagging eyebrows. Upper eyelid surgery can last anywhere from five to seven years or sometimes an entire lifetime and lower eyelid surgery rarely needs to be performed more than once. Blepharoplasty will reinvigorate an aging face, making your eyes look bright and alert. 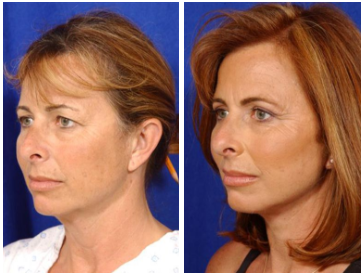 Advanced techniques restore youthful characteristics by relying more on restoration and Dr. Moelleken’s goal is to allow you to still look like yourself: just younger and better. Dr. Moelleken’s patients are very pleased with their surgical outcomes from eyelid surgery so call today and schedule your consultation so you can get back the youthful look you deserve. Your eyes are considered the most significant feature of your face because they reflect your personality and mood. Unfortunately, your eyes also display the first marks of aging as fatigued folds above and puffy bags underneath your eyes add years to your appearance. Aging is inevitable and one day we all look in the mirror and notice wrinkles, especially those around our eyes. As your skin ages, it gradually loses its elasticity and a lack of elasticity combined with the constant pull from gravity causes excessive skin to collect in your upper and lower eyelids. This excess skin causes wrinkles and on your upper eyelids, an extra fold of skin forms that can hang over your eyelashes and obstruct your vision. The fat that cushions the eyeball from the skull can also cause bulges in your upper and lower eyelids. The thin membrane that holds this fat in place weakens, as you grow older, allowing the fat to protrude into your lids. These changes will make you look older and more tired than you actually feel. Eyelid surgery, or blepharoplasty, is an enhancing surgical procedure performed to eliminate cosmetic eye defects. Blepharoplasty is performed to reduce the wrinkling and/or bulging of your eyelid tissue. If you are interested in rejuvenating your eyes, making yourself look younger, or correcting an issue that you currently have with your eyes, the first step is to set up a consultation with Dr. Brent Moelleken, M.D., F.A.C.S. He is a world-renown plastic surgeon you can trust to be up-to-date with the contemporary techniques involved in the blepharoplasty procedure. During your consultation, he will examine you and ask questions regarding your vision, tear production, use of lenses, and why you have chosen to have eyelid surgery. You may be asked to look in a mirror and point out exactly what you would like to see improved, as this will help Dr. Moelleken understand your expectations and determine whether they can realistically be achieved. You should be prepared to discuss your medical history and it is important for you to provide complete information. Factors to be weighed before having this procedure include age, skin type, ethnic background, and degree of vision obstruction. Whether your surgery is desired for functional or cosmetic reasons, you must be willing to make the commitment to follow the pre-surgical and post-operative instructions to ensure a successful conclusion. Dr. Moelleken will also educate you regarding other procedures you may wish to think about to compliment your eyelid surgery and the technique best indicated for your individual surgery will be discussed. The type of anesthesia and the risks inherent to your procedure will be outlined and you will be encouraged to voice any questions or concerns you have.